Starting at 8:00 am Eastern tomorrow, Mozilla will join with other sites in a virtual strike to protest the Protect IP Act (PIPA) and Stop Online Piracy Act (SOPA). These bills protect content at all costs, creating the opportunity for abuse and damaging the Web for all of us. We will be blacking out the default start page in Firefox and redirecting key Mozilla websites to a special action page. Both steps are aimed at informing and mobilizing millions of our users on this important issue. 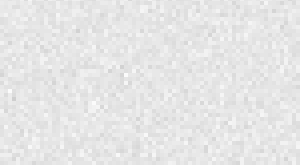 Mozilla’s Chairwoman Mitchell Baker has a blog post that further explains our concerns with the legislation, using a powerful analogy from the physical world to highlight how misdirected PIPA and SOPA are at this point. These steps are complimentary to those participants in tomorrow’s online protest who are focusing on taking websites offline. We’re giving this degree of in-product visibility on PIPA/SOPA with the hope that this precedent-setting move will motivate people to ask their Congressional representatives to carefully consider all the facts and viewpoints before moving either of these bills forward. This campaign will not effect people’s experience with Firefox, however, we hope it raises awareness and engagement. We’ll return people’s default start page and stop redirecting traffic at 8:00 pm Eastern tomorrow. 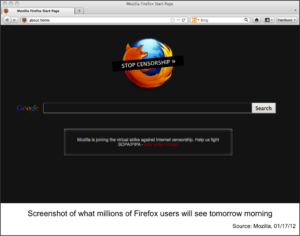 From the beginning, Mozilla has been a key force in rallying opposition to PIPA and SOPA. On Nov 16, as part of the American Censorship campaign, Mozilla censored its logo and used the power of our start page in Firefox to engage our community. The results were awesome, generating thousands of emails and calls to Congress, and helped change the tenor of the public debate in the House. Mozilla releases a joint letter with Google, Facebook, Twitter, LinkedIn, Zynga, AOL and Yahoo!